Tuners are an incredibly important tool for all musicians, and it’s important that students have quick and easy access to a good tuner. Since there are so many tuner and metronome apps on the market (and I’m sick of students saying “I don’t know which one to get!”) I’m going to start reviewing them, to help students decide which is the best one for them. I’m choosing to start this process with one of the simplest tuner apps – ClearTune (available on both iOS and Android for $4) by Bitcount. Some of the different tuning temperaments. The pitch generator screen. Press the “power” button to sound the selected note. 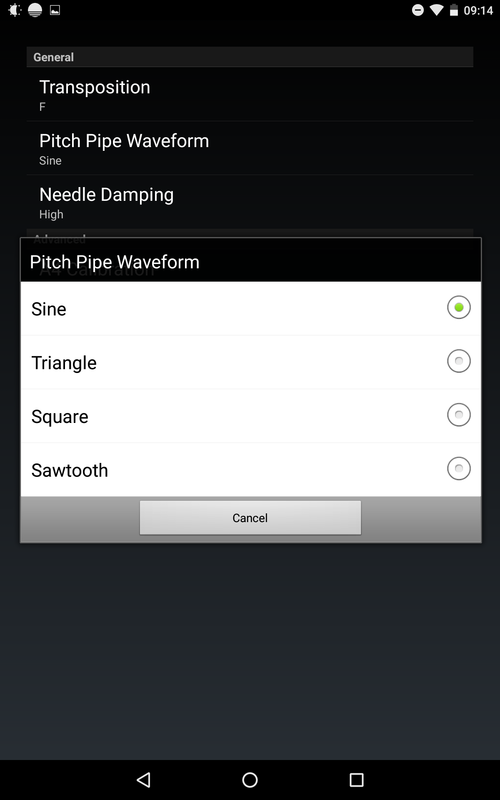 The four different wave options for the tone generator. First things first – ClearTune is a tuner only. 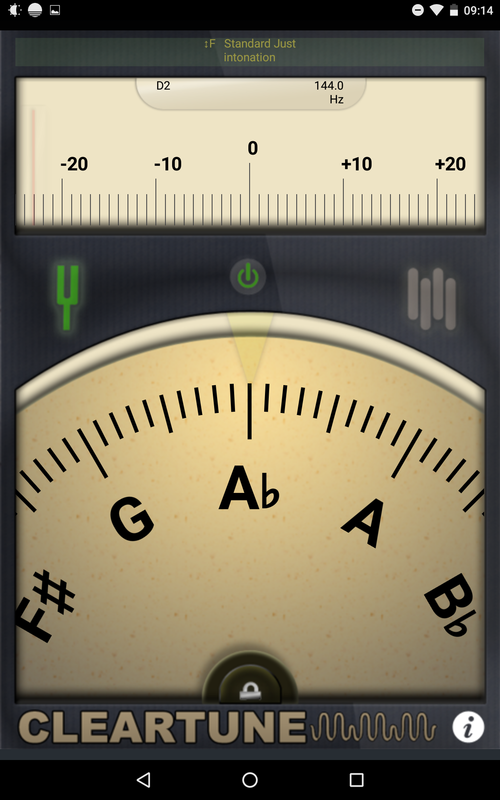 Many apps for musicians now have both a tuner and metronome (and sometimes additional features), but ClearTune is a one-trick pony. This isn’t necessary a bad thing, but if you’re looking for an all-in-one solution, ClearTune is not it. This app costs $3.99 on both iOS and Android – I’ll be looking at the Android version, since I have both an Android phone (Nexus 5) and tablet (Nexus 7). If anyone has used ClearTune on an iPhone or iPad and wants to give their opinion, please add it in the comments below! One of the biggest positives about ClearTune is its simplicity – it’s very easy to read and use (even on a small screen), and the lack of extraneous options or features makes setup and use very straightforward. A couple of recommended settings – I would set the “Needle Damping” option to “High” to make it easier to see your average pitch level – “Medium” or “Off” both seem to make the needle waver quite a bit and hard to read at a glance. This is likely highly microphone-dependent, though – try all three and see which option works best! Also, spend some time trying all four of the pitch pipe sounds – depending on your device’s speaker and the instrument you play, you may find one is significantly easier to hear and tune to. The pitch recognition and tuning accuracy with ClearTune appears good – using an A=440 reference tone, the tuner will show between “in tune” and a maximum of around 5 cents flat. Even with a pure computer-generated tone, the tuner does show a slight bit of a pitch waver (at the highest damping level), but so much of what a tuner measures depends on the microphone that it uses, and I don’t have any particular reason to think that the Nexus 7 or Nexus 5 have a mic which is tuned to capture the pitch of a relatively loud brass instrument. ClearTune’s default setting is for it to automatically detect the pitch that you are playing, but it can be locked to a specific note if you desire. ClearTune also has a wide variety of tuning systems preloaded (although you can’t, unfortunately, add your own custom tunings), however, when using a tuning that depends upon a ‘key center’ (such as Just intonation) changing the key can require a couple of steps, since you have to go into the menu, select the new key, and then return to your tuning screen. Additionally, there’s no indication about which key you’re in on the main tuning screen – it tells you that you’re in “Just intonation”, but not what the key is set for. It also doesn’t give any information about the deviation of a certain note from Equal temperament – not a necessary feature, but it’s nice information to have. The pitch pipe function of ClearTunes is fairly good – the lowest and highest octaves available to sound will likely be unusable – either too quiet (the lowest notes) or inaudible (the highest octave). This, plus the four different wave forms, will give you any note that you need, although the volume is a bit quiet (even with device volume turned all the way up) compared to some other tone generators. There is no in-app volume setting. One interesting setting on the tone generator – not only can you play in 10 chromatic octaves, if you tap on the padlock at the very bottom center of the screen, you can then rotate the pitch wheel and get a glissando effect – playing in-between the usual half-steps. I’m not sure exactly what this would be useful for, but I’m sure there’s some 20th century piece somewhere that can make use of it. If you’re looking for a straightforward, stand-alone tuner, ClearTune is a good choice. It hasn’t been updated in a while (so I wouldn’t expect added features after you purchase it), but it doesn’t seem to have any problems that need fixed. It’s a little bit limited in some respects and it doesn’t have any additional features (metronome, recorder, etc. 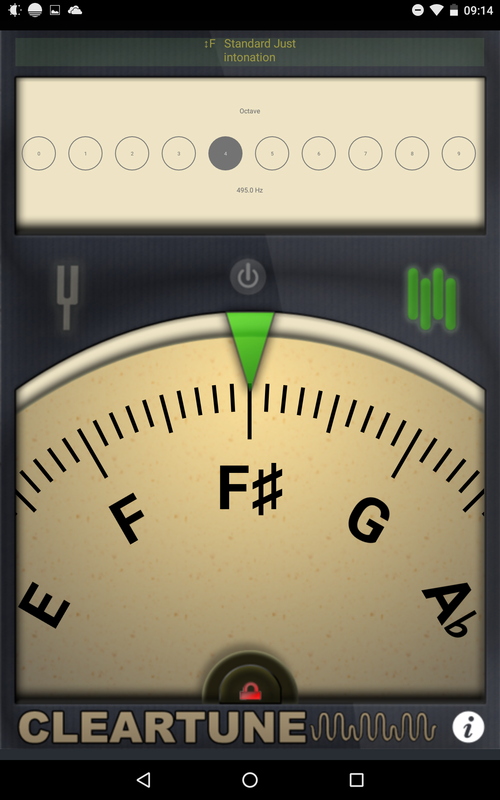 ), but it is a good, solid, and easy-to-use tuner. You can get it for iOS (both iPhone and iPad) or Android phones and tablets for $4. You can find more apps for musicians over here, and all my app reviews here. 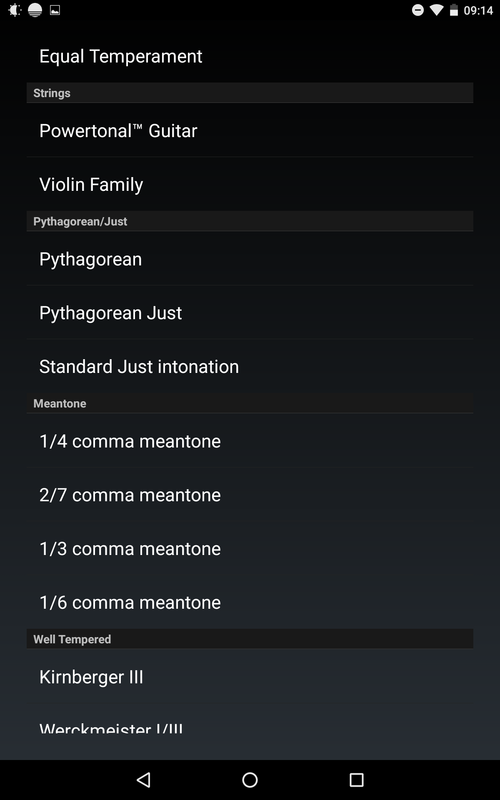 ← Google & Bing make finding a metronome even easier!